Export to Cow Sense for powerful reports and analysis! 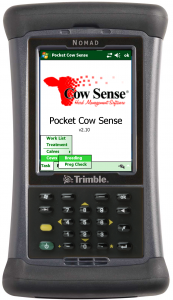 A Pocket PC equipped with Bluetooth communications allows you to use a wireless EID Reader to scan EIDs onto calf records or “lookup” records of either calves or cows. Scan EIDs when processing a group of cattle to create a “Work List” of EID numbers. 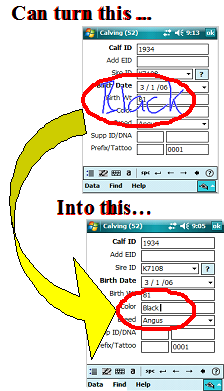 Then import this data into Cow Sense to update cattle records, inventories by location, change locations, create a shipment listing or record group processing information.